One of Izumo's subordinates, and the man whom Cayenne saw with Mikono in his "wedding in mourning clothes" vision. Feeling Mikono's scent, Kagura claims that he had found his "wench" and thus, is determined to claim her at all costs. Going far as disobeying Izumo and searching for her alone in Vega. His behavior is similar to a wolf and his sense of smell is so strong that he can track the one he desires easily. When he is aboard of his mecha, Misla Gnis, his sense of smell grows stronger to the point he can smells the pilots in the Vectors. Later on, it's revealed that he is also a element user. His power is to "reverse", allowing him to reverse the damage in his own body to the one trying to inflict it or even reversing the blood flow within another's people heart. And just like it occurs with other elements, Kagura's reversing power is reflected on his speech, as the more he craves for Mikono, the more he insults and threatens her. 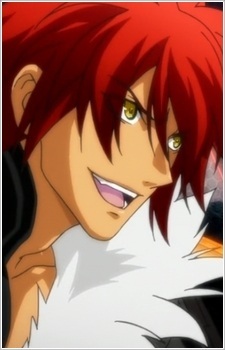 His appearance and attitude resemble those of Apollo, the protagonist of the original Aquarion series.